These steps will guide you through setting up the Single Sign-On functionality between OneLogin and Parature. Search for Parature that is a SAML 2.0 connector and select it. Under Domain, put the domain of your organization's Parature instance. Now go into your organizations Parature admin account. Go to Customization > SSP Settings > Endpoints. Select New Service Desk End Point. Give your Endpoint a Name. Click the icon next to the Lookup Query for Login field. Note: you can replace 'csr' with 'cust' if you are referring to regular users, not CSRs. After saving, the Endpoint URL will appear in your New Service Desk Endpoint profile page. In OneLogin, go to Apps > Company Apps > Parature. Under Endpoint URL, put your Endpoint URL generated in the Parature Endpoint page. 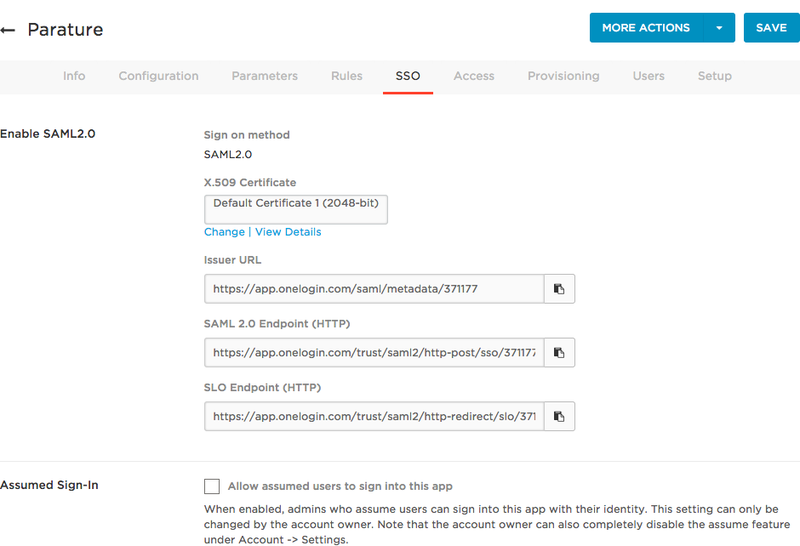 With the configuration complete, OneLogin and Parature should be connected through SAML! Select Parature to open the Edit Login pane. Here you may overwrite the default fields for your Parature login and insert the correct information to match your OneLogin credentials with your Parature credentials.